Brood parasites are birds that rely on other birds, often of a different species, to raise their young. Brood parasitism occurs in organisms other than birds, including fish and insects, but we'll focus on a few well-known bird examples here. This type of breeding strategy allows biological parents to avoid the stress and time involved in raising young. The strategy often involves laying eggs in several different nests in order to maximize the chances of young being raised successfully to fledge. The parasite bird also often removes an egg from the host parent to reduce discovery and improve their own offspring's chances of survival. Brood parasite birds generally have a shorter incubation period (with incubation actually starting internally within the biological mother bird) which also gives their offspring a head start over its adopted nest mates. A big risk with this strategy is discovery of intruder eggs. Some host species have learned to recognize intruder eggs in their nest, which may lead to total abandonment of the nest. Sometimes the discovery is made after hatching, and the parasitic chick is expelled from the nest. Another risk is using a host with a diet unsuitable for the growing chick. American Goldfinches are vegetarian; Brown-headed Cowbirds have an omnivorous diet and will not survive to fledge from finch parents. Cowbirds and cuckoos are probably the most well-known species of brood parasites in the bird world. The Brown-headed Cowbird is widespread across North America. This species has at least 221 known host species, from hummingbirds to birds of prey. The Common Cuckoo of the Old World has wide distribution across Europe, Asia, and Africa. It takes a female cuckoo just 10 seconds to remove one egg and lay her own in a host's nest. Common Cuckoos have been recorded using over 100 host species. They are generally much larger than their hosts and the quickly-growing chick typically will remove all of the other eggs from the nest itself. Have you ever seen a Brown-headed Cowbird, Common Cuckoo, or other brood parasite being fed by a host parent? Sexual dimorphism refers to observable differences between males and females of the same species. In basic terms, it means that a male of a species is easily distinguished from a female. In birds this usually means differences in size or in plumage. It can also be noted in behavior differences and other traits. Earlier on this blog we talked about the extreme sexual dimorphism in Eclectus Parrots, where males and females show extreme differences in their plumage: males are bright green while females are shades of red and blue. Sexual dimorphism exists in most species of raptor. In birds of prey, males are often smaller than the females of the species. However, this is often difficult to discern in wild birds, especially if seen at a distance or when only one bird is present. Many common birds also exhibit sexual dimorphism. 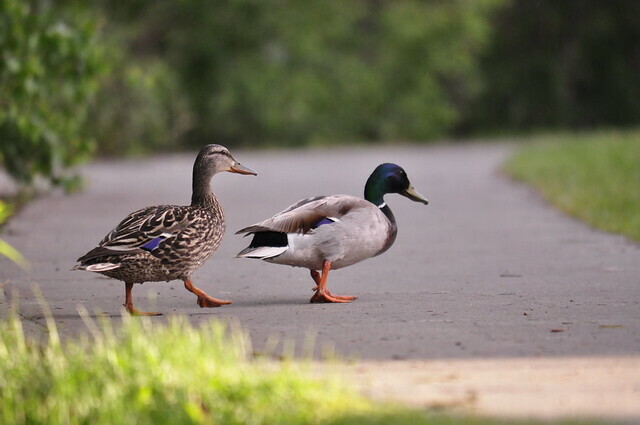 Male ducks are often colorful, while females tend to be drab. You can see this in the common Mallard. In songbirds, males may be brightly colored while females have a similar plumage with more muted tones, as seen in Baltimore Orioles, American Robins, Eastern Towhees, and Black-throated Blue Warblers. In other birds, like the Eclectus Parrot mentioned above, the plumage differences are extreme. Examples of this can also be seen in the Superb Fairywren of Australia, and the Sage Grouse. Can you think of other bird species where the male is easily told apart from the female? Do you have birds like this where you live? What about birds that aren't sexually dimorphic? Can you think of species where male and females are impossible to tell apart by looking at them?